I love chocolate as much as the next girl, but when it comes mixed with tea? You know I had to give it a try! If you’re not familiar with Purdys, they are a chocolate company based in Vancouver, British Columbia. Their stores feature chocolates, candies, ice cream, and more. The purple and gold store fronts can also be found across Canada, and I picked up this box of Matcha at a store near me. Inside the box, there are six beautiful chocolates. Each one has a unique speckled design on it – according to the product page, Purdys uses a spirulina-based dye mixed with cocoa butter to create the colours. 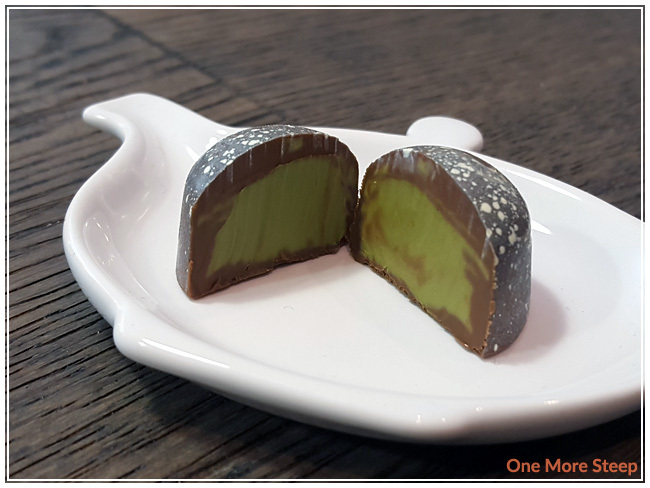 Matcha is a unique truffle that consists of a blend of white chocolate and matcha green tea powder, inside of a milk chocolate shell. Each chocolate is nestled in its own brown paper cup. The aroma that I get from the chocolate is milk chocolate. The ingredients in Matcha are: sugar, milk ingredients, cocoa butter, unsweetened chocolate, coconut oil, matcha powder, natural and artificial flavours, soy lecithin, turmeric, spirulina concentrate, apple concentrate, titanium dioxide, water, sunflower oil, maltodextrin, and citric acid. I cut my first Matcha chocolate in half. The green centre of the Matcha has a sweet, grassy aroma to it. 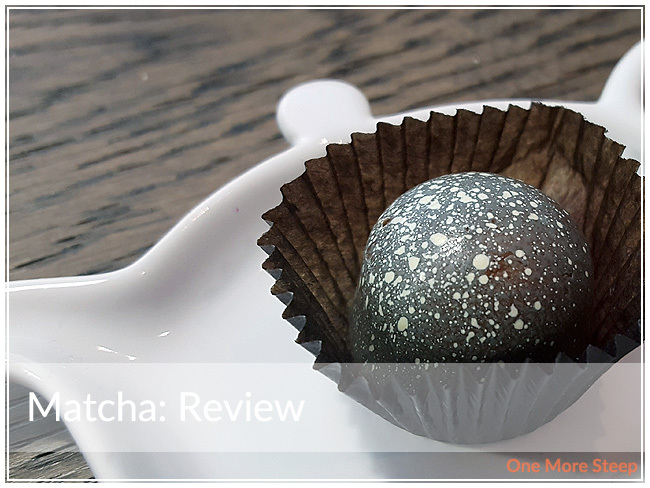 The flavour reminds me a lot of a matcha latté – there’s a touch of honeyed sweetness, grassy notes, a touch of saltiness, and the milk chocolate shell just melts in your mouth. Despite it being a fairly hefty chocolate, it’s quite light in terms of the mouthfeel – there’s a nice decadence to it. 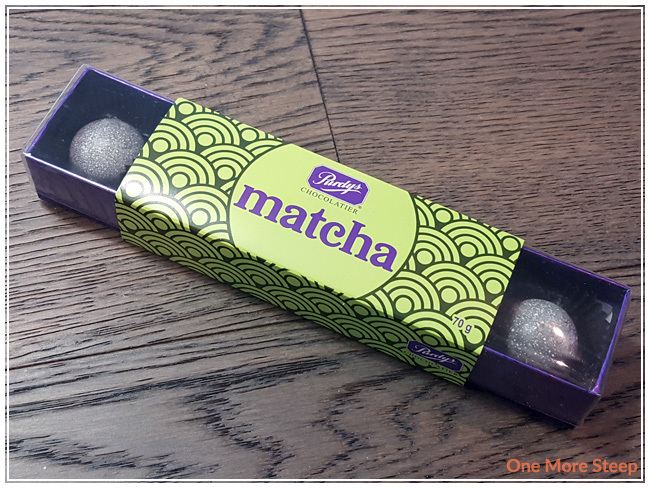 I loved Purdys Chocolatier’s Matcha. I think that the matcha flavour really shines through. The speckled decoration is beautiful, and I really like how they used natural dyes to create the colours. The milk chocolate shell is superb, but as someone who’s grown up eating Purdys, I don’t expect anything less. These are nice for a treat, at the price of $11 for 6 pieces, it’s definitely not something that I’ll have around all the time, but they’re quite tasty and I would recommend trying it out if you’re a fan of matcha and chocolate.